So you know how the other day I mentioned my huge pet peeve with Dior mascaras? Well, I think it's time I step outside of my Dior box. And what better way to do that than with the new L'Oreal Double Extend Beauty Tubes Mascara? I mean, I say when you try something, you go all the way. And this double-ended mascara wand sure has got me jumping for joy. I actually refrained from testing this mascara for quite some time because of its claim to coat your lashes with little tubes. That scared me so much -- I have no idea why, as I have no problem swiping on three or four coats of a regular mascara or wearing false eyelashes for a night on the town ... but for some reason, the thought of my lashes being encased in tiny tubes just really didn't sit right with me. I finally decided to try it out, however ... and what a change it has made in my life! First off, one side of this mascara contains a primer. And you all know by now how I feel about primers! I've been finding more and more that it really is a good idea to coat your lashes first with a primer -- you'd be surprised at how much more lasting the effects of even the mascara most likely to adhere to your lashes will become. So I swept on the primer, waited about 10 seconds and followed with one coat of the mascara end of the tube. ONE COAT. Would you believe that's all it took to create lashes so long and lush, I would swear I was wearing fakes if I didn't know the truth? Seriously, fellow beauty chicks. YOU GET AMAZING LASHES IN ONLY ONE COAT OF THIS MASCARA. And the whole tiny tubes factor? It didn't, well, factor into my feelings about this mascara in the end at all. It's not like you really look like you have tubes on top of your lashes. It just makes them look flawless, perfect and so long they'll hit your glasses. My one note is that this mascara does not wash off with just water as the directions say. I tried that and was left with tiny flakes all over my face! Best to use an eye makeup remover like Lancome Bi-Facil to really make sure every trace of it is gone. 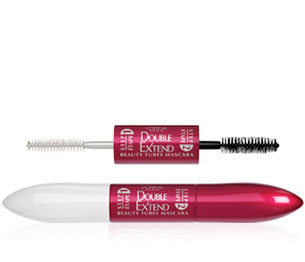 L'Oreal Double Extend Beauty Tubes Mascara is $10.95 at drugstore.com. Yes, I know this is a dollar over my normal $10 and under routine for Wallet-Friendly Wednesdays -- but in this case I just had to make an exception!